Gallia Academy’s Justin Wilcoxon (right) drives past Point Pleasant’s Kyelar Morrow (2), during the Blue Devils’ 65-28 victory on Saturday in Point Pleasant, W.Va.
PPHS junior Damon Thompson (1) dribbles near the top of the key, during the Big Blacks’ 65-28 setback on Saturday in Point Pleasant, W.Va.
POINT PLEASANT, W.Va. — When you’re hot, you’re hot, but when you’re not, you’re not. 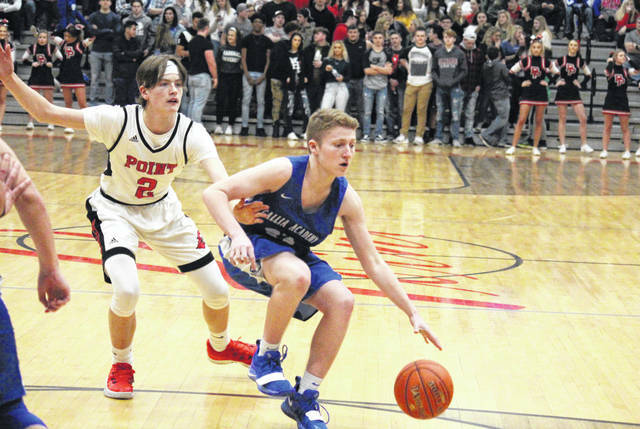 The Gallia Academy boys basketball team shot 56 percent from the field and held non-conference host Point Pleasant to just over 20 percent from the field on Saturday in ‘The Dungeon’, leading the visiting Blue Devils to a 65-28 victory. Gallia Academy (12-8) never trailed in the contest, scoring the first five points and leading 9-3 at the end of the opening quarter. 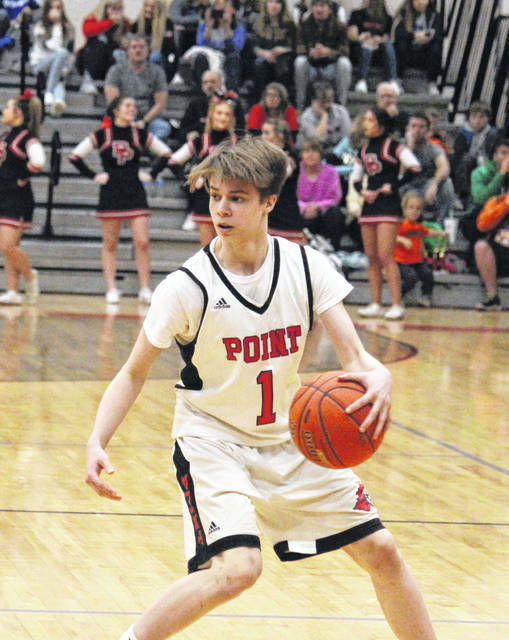 Point Pleasant (4-13) was back to within four points, at 13-9, after beginning the second quarter with a 6-to-4 spurt on 6-of-6 free throws. GAHS drained a trio of three-pointers en route to a 9-to-5 run over the remainder of the half and headed into the break with a 22-14 edge. 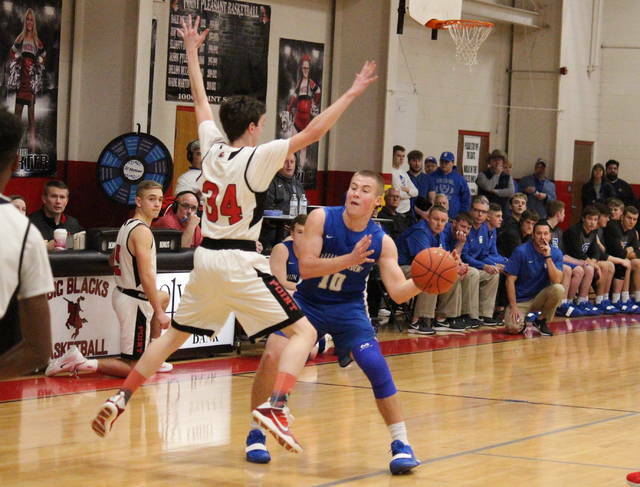 Gallia Academy broke the game open in the third quarter, hitting 11-of-12 field goals during a 27-to-8 run, and making the margin 49-22 with eight minutes to play. The Blue Devils stretched their advantage to as many as 39 points in the finale and settled for the 65-28 victory. Following a second triumph in as many nights, GAHS head coach Gary Harrison acknowledged the slow start, and talked about the turnaround in the second half. “In the first half I thought we were a little bit sluggish,” Harrison said. “We had a Justin (McClelland) and Cory (Call) in foul trouble in the second quarter, and I give our kids credit, there’s two leading scorers out of the game and we’re still ahead going into halftime. I feel like were a third quarter team, we scored 27 in the third and outscored them 43-to-14 in the second half. I guess you could say it took us a couple quarters to get our engine revved up. For Point Pleasant — which entered with back-to-back wins — head coach Josh Williams took the setback as a humbling experience and credited the GAHS defense for controlling the game. “We had a little momentum going for us, but as far as becoming a better basketball team, there’s a lot of things we still need to work on,” Williams said. “The defense was good, but we just have to find better ways to get our guys in better position to score. Our spacing was bad at times, which allowed them to jump passes. The Blue Devils’ 56 percent shooting percentage came on a 28-of-50 clip from the field, featuring 5-of-13 (38.5 percent) from beyond the arc. PPHS made 8-of-39 (20.5 percent) field goal attempts, including 3-of-18 (16.7 percent) three-point tries. GAHS made all-4 of its free throw attempts, while Point Pleasant was 9-of-12 (75 percent) from the foul line. The guests won the rebounding battle by a 33-to-16 count, including 10-to-5 on the offensive glass. The Blue Devils committed 17 turnovers, just six after halftime, while the Big Blacks turned the ball over 22 times in total. Collectively, the Blue and White tallied 21 assists, 11 steals and one block, while the hosts had a dozen steals, six assists and a pair of rejections. Blaine Carter led the Blue Devils with 13 points, followed by Bailey Walker with 11 points and team-highs of three trifectas and nine rebounds. Cory Call finished with 10 points and five assists for the guests, Justin McClelland added nine points and five assists, while Damon Cremeans chipped in with six points. Cole Davis, Ben Cox and Caleb Henry scored four points apiece in the win, with Henry also dishing out five assists. Colton Caldwell and Cooper Davis rounded out the GAHS total with two points apiece. Gallia Academy’s defense was led by Call and McClelland with three steals apiece, followed by Cremeans with a steal and a block. 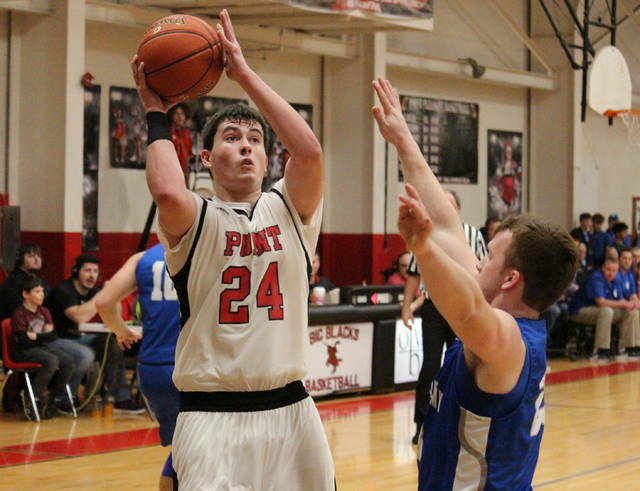 Hunter Bush led Point Pleasant with eight points and five rebounds. Braxton Yates was next with seven points, followed by Bradyn Canterbury with four, and Kyelar Morrow with three. Jordan Daubenmire and Evan Cobb scored two points apiece for the hosts, while Aiden Sang and Trey Peck tallied one each. Bush also led the PPHS defense with five steals and a block, followed by Jovone Johnson and Nick Smith with two steals apiece. Six Big Blacks finished with one assist each. This marks the season sweep for the Blue Devils, who also defeated PPHS on Jan. 5 in Centenary by a 67-39 count. Both teams are back in action on Tuesday, with the Blue Devils visiting South Point, and Point Pleasant hosting Sissonville.